The surprisingly meaty PAX East demo for Distance gives a heck of a lot of things to experiment with in the game, which describes itself as a sort of narrative-based arcade racing experience. In it, we’re in control of a car on a neon-infused techno raceway with the lone goal of surviving everything thrown at us. Like most other racers we use the triggers to speed up ad slow down, and the control stick to turn and adjust course, but the similarities basically end there. 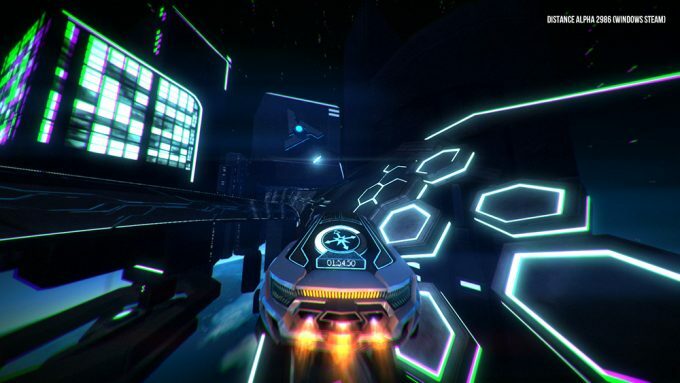 A spiritual successor to Nitronic Rush, a Digipen student project by some of its designers, Distance is perhaps as much a platforming action game as it is a standard arcade racer. We need to avoid obstacles, cross giant ravines, and avoid prematurely ending our racing careers on courses that take minutes to complete. There are no laps; the story mode is designed so that it plays out like an FPS in a corridor, pushing us forward to complete an area at a time before we zoom through a portal at the end. 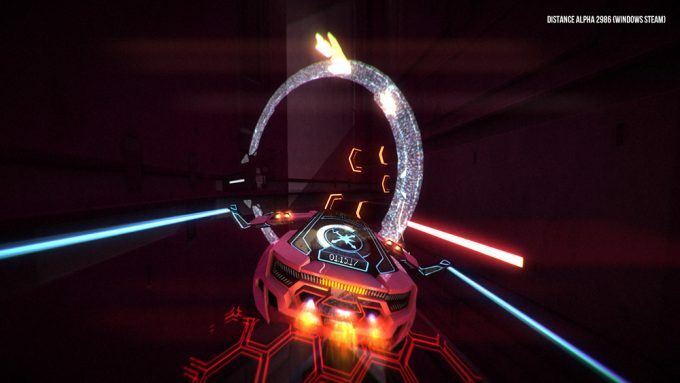 The arcade side allows for splitscreen multiplayer as well as online, with fans creating and sharing courses on their own in the Steam Workshop. Our cars aren’t just machines with four wheels. The game turns them into AI characters, having “awoken” just as humanity has disappeared on the planet. The game’s hud isn’t on the screen, but rather on the vehicle; where we normally find tail lamps, we have a boost indicator, and the roof line of the cars contain even more details about our status. This helps to contain the distractions around the screen, as the physics of the vehicle are important to understand. Controlling the game feels like a cross between Mario Kart, Sonic the Hedgehog and F-Zero, with speed and twitch controls a necessity to manage. We can boost down the speedway for added speed, but that could also lead to overheating. Thankfully, cooldown patches can help along the way. Boosting gives a quick speed bump, and can help us cross giant gaps if we time a boost over a ramp. The platforming structure of the game also lets us jump, clearing obstacles like barriers and lasers as needed. Crashing through a laser or saw blade slices up our car, but we can still move forward if we have just one wheel intact. If we survive the split we’ll eventually regenerate our missing halves. We can “run” along the sides of some tracks to access better pathways or avoid a wall in our path, adding to the parkour nature of the experience. At certain points on a course we can even fly, with our cars sprouting wings to travel greater distances. The control shifts from a planar aspect to an almost full 360-degree mode, in which we move up and down as well as just left and right. The controls feel solid and stable, and though spinning off of the track early on can (and will) happen, we very quickly master the in & outs of our vehicle. This is how I played with Hot Wheels when I was younger. I wouldn’t just drop them down ramps, but would pretend they were characters that could also fly, swim, and save the planet. Distance aims to do the same thing, giving us a character that just so happens to have four wheels and placing it in a world that’s trying to kill us. The nostalgia flares up in me at the concept, and the execution is something definitely worth checking out. Distance is in Early Access now and supports Oculus & Vive VR for those that want to experience it in blazing speed.